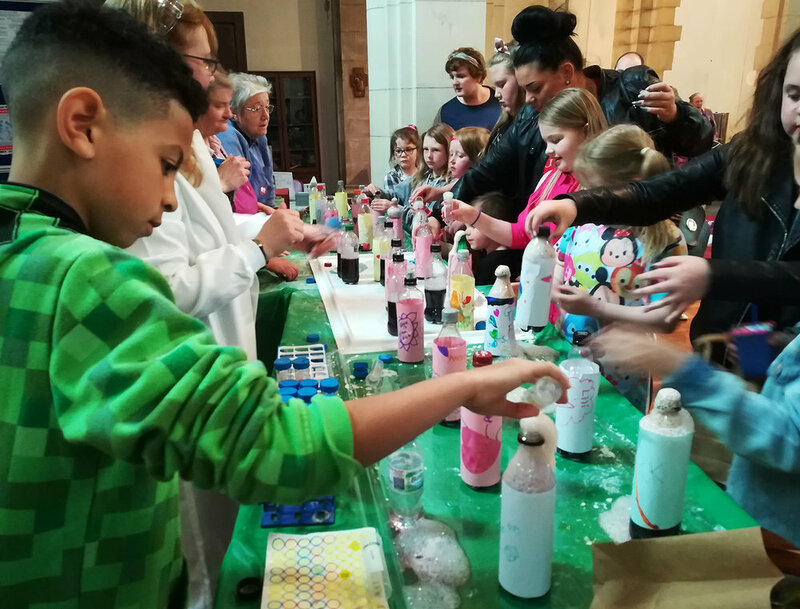 It's been a fantastic week of playing and praying in the parish, with Messy Church does Science at St Tydfil's and prayer events at St David's as part of Thy Kingdom Come, the global wave of prayer. Science puts the Mess in Messy Church! Messy Science was our biggest Messy Church yet, with over 60 children attending accompanied by their families, and everyone having an amazing time. It was a joint event with Swansea University Medical School, represented by Abercanaid churchwarden, Dr Claire Price, and her colleague and fellow STEM Ambassador, Dr Josie Parker. STEM stands for science, technology, engineering and mathematics and is a global initiative to inspire and educate children and young people in these subjects. Dr Claire explains "I love science and really wanted to try and bring that joy and enthusiasm to a wider audience. What better place than Messy Church to do that? So I spoke to Rev Charlotte about a potential collaboration and the rest, as they say, is history. We wanted to share that science and religion are not mutually exclusive - science is amazing but doesn't mean there is no space for God." The crafts undertaken during Messy Church does Science were a showcase for God's vision for us, in that we are all unique. Three simple white powders; sugar, bicarbonate of soda and cornflour, look similar to the naked eye, but each possess properties that make them unique, like each of us. When you look at each powder under a microscope you can see that under magnification they look very different. We then used sugar to make a sweet treat by decorating yummy biscuits. Snowflakes were made and decorated as no two snowflakes are the same, they are unique like us. Cornflour was mixed with water to produce Oobleck slime! And finally, bottles were decorated to make volcanoes, which were erupted using bicarbonate of soda and vinegar. With songs, stories and a picnic to top things off, it was a really special event, and we were pleased to welcome Assembly member Dawn Bowden and Martin Eaglestone, Welsh Policy Officer for Labour, who came along to see the action and also to support Rev Charlotte as she prepares for her ordination as the first female priest in the Parish of Merthyr Tydfil. 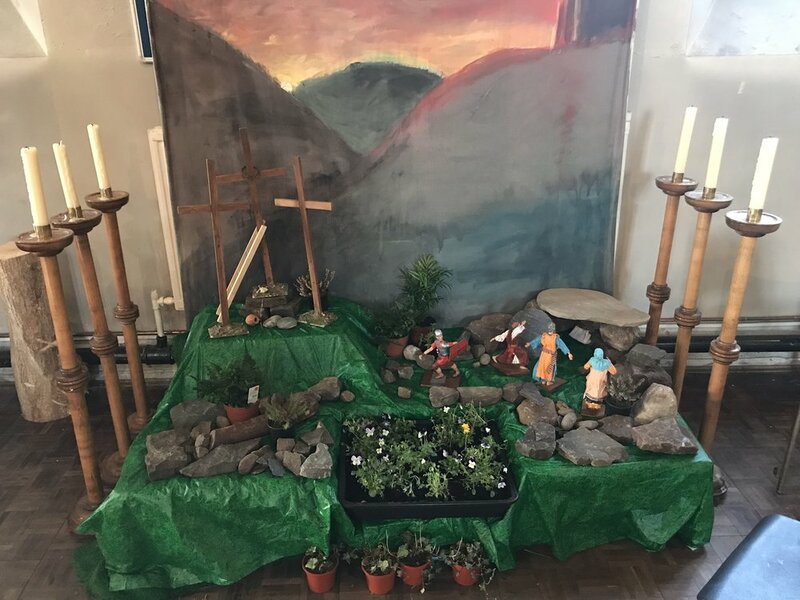 We hope you enjoy the photographs and don't forget the next Messy Church is at St Tydfil's on 7th July from 2-4pm and it's called 'Fish caught in the net'. Celia and Jan make a mess! 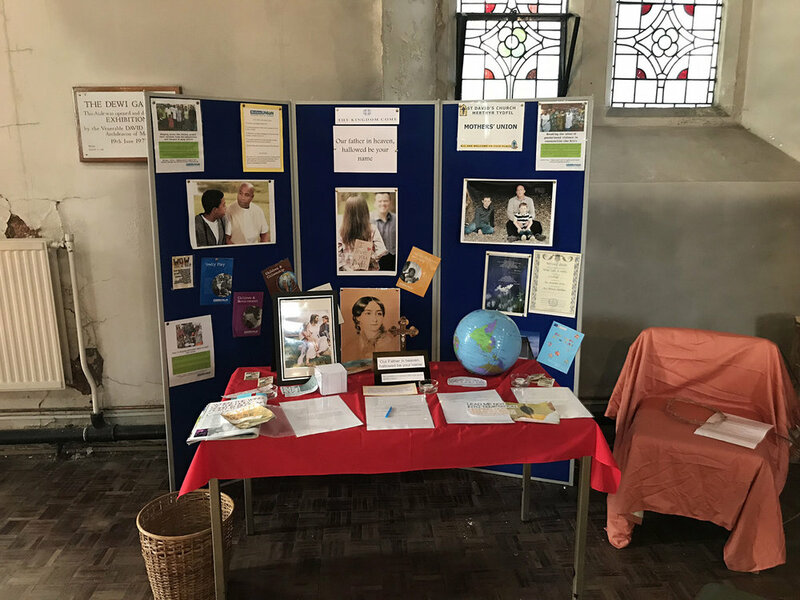 Our prayer events at St David's were part of the Thy Kingdom Come global prayer movement, which invites Christians around the world to pray between Ascension and Pentecost for more people to come to know Jesus Christ. The movement began as an invitation from the Archbishops of Canterbury and York in 2016 to the Church of England and has grown into an international and ecumenical call to prayer. As well as a service for the National Day of Prayer for the Police, the parish also held 24 hours of prayer for Merthyr Tydfil over two days. Different prayer stations were set up and people could stay for as long or as short a time as they wished. 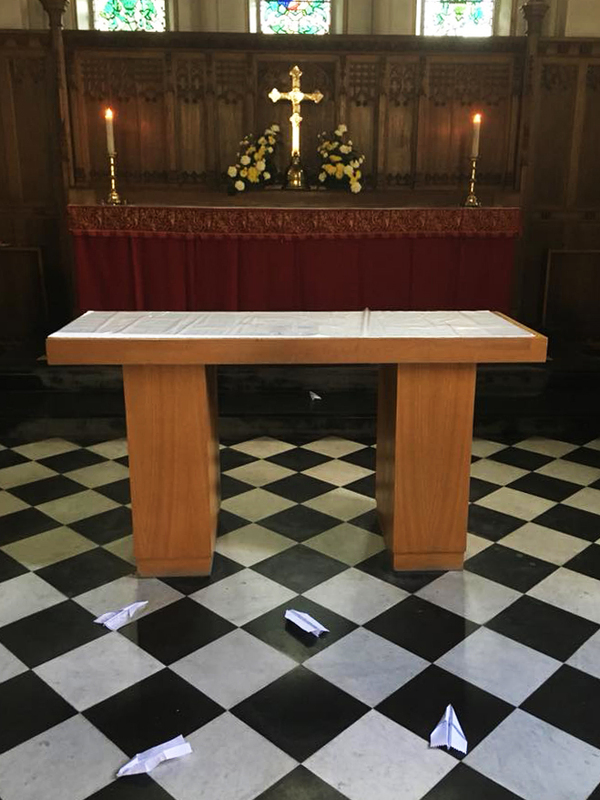 The photographs show the Mothers' Union prayer station, the Garden of Gethsemane and paper aeroplane prayers. Churchwarden Dorothy Evans said "I went along to this today and would recommend it to anyone who hasn't already been. 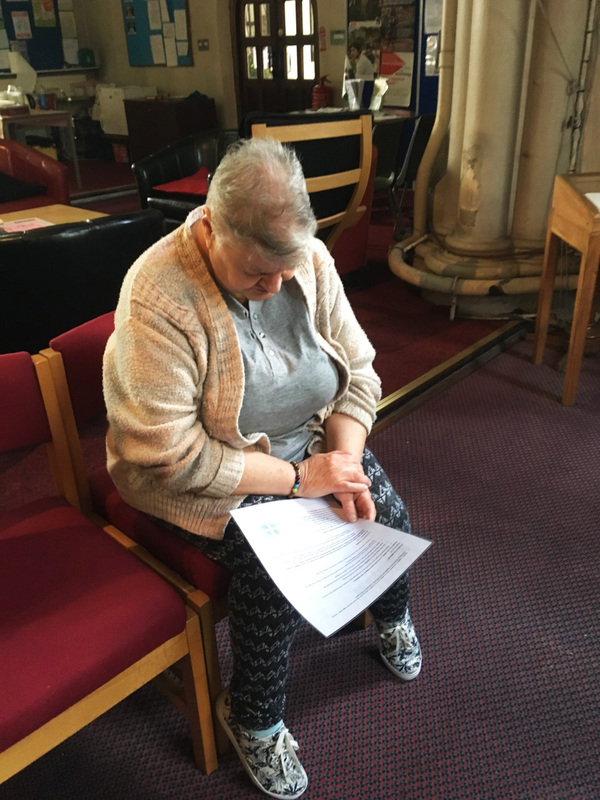 There was a lot of information and guidance to help with prayers and also plenty of food for thought." Thank you to everyone who attended. Newer PostA Wonderful and Blessed Ordination Day! Older PostA New Look for our Annual Report!